Storage Data Analysis at your fingertips. Maximise, audit and alerting software for Self Storage. Works with SiteLink Web Edition™ Save thousands of dollars of concessions and fine tune your facility income stream. Unlock hidden cash from your Self Storage assets. Every day, every transaction is analysed by District Manager® LITE. As you work, District Manager® LITE is checking concessions and looking over the shoulder of the facility looking for any transaction out of character, alerting you in real time.Even down to the banking. Was it done? How would you even know if your Self Storage Facility is in another state or country? District Manager® LITE is looking after your income stream and works to maximise every dollar of income available. Human nature makes it hard sometimes to get financial tasks completed. From reluctance to inattention, District Manager® LITE is watching. Increase your monthly revenue by hundreds, even thousands, of dollars with District Manager® LITE. Review which managers are giving discounts or waiving fees and know why. Simple reports reveal waived fees and discounts. District Manager® LITE analyzes your concession plans by cost per move-in, leases generated, and average stay, making it easy to identify which plans are the most cost-effective and which plans should be eliminated. Concessions can make you money if you know which ones do. District Manager®’s discount management reports allows you to easily filter through discounted tenants and display those eligible for a discount reduction based on your own criteria. 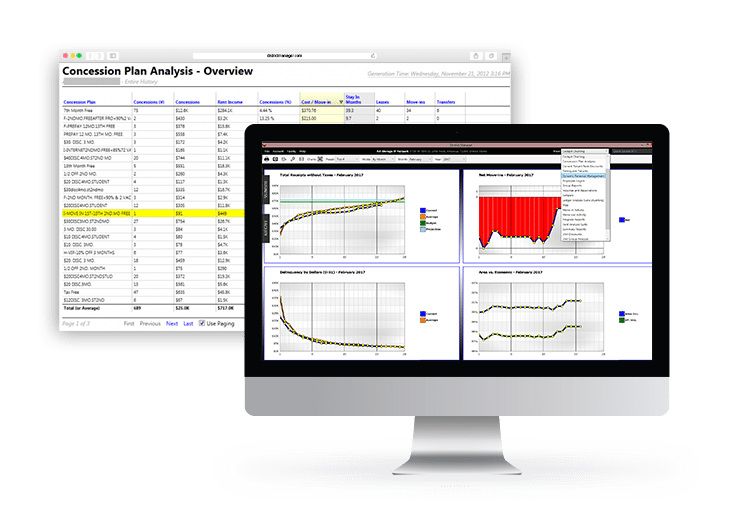 District Manager® LITE allows you to quickly audit your facilities. It’s comprehensive auditing suites report at the facility, tenant, and employee level. Audit every facility in your operation at the same time, instantly drill all the way down into any tenant’s ledger and view any notes associated with individual transactions. It’s easy for money to be given away. Auditing uncovers unneccesary credits and much more. District Manager® LITE’s customizable Cockpit Charting view provides the means to quickly see various vitals, side by side. Facilities can be grouped together, e.g., by regional manager, region, ownership, etc., and then plotted allowing you to easily monitor and/or compare. The performance of the group can be analysed and even a one site organization can benefit from simple, easy to read charts. Charts the way you want. District Manager® LITE constantly monitors your facility or group to alert you of critical activity in a timely manner. When such activity is detected the system will immediately send an email containing a description of the event, an associated chart to put it into context and a list of recommendations to mitigate future occurrences. Alerts in real time keep you informed. Create custom facility groups to shape data and meet your organizational needs. Run reports on facility groups to easily monitor and/or compare performance. View reports that combine the activity of each individual facility in a group into a single seamless report, e.g., move-ins. Use Group reports to compare performance for multi-site groups. Data can be hard to analyse and comprehend. District Manager® LITE’s powerful visualizations and infographics make finding a needle in a haystack easy. It’s hard to get the overall picture of any given subject matter directly from a long data report; it usually takes a while. Visualizations, like District Manager®’s facility Heat Map, present the overall picture of facility performance allowing you to almost instantly comprehend the current level of activity and spot anomalies. Heat maps deliver string visual performance indicators. District Manager® LITE examines unit groups and provides reports that direct attention to the sites that need it most. Unit group analysis reports, like the “Stay and Re-Lease” report, present the true value of your units by showing key metrics like vacancies, average stay, average effective rate and average gross per tenant. These kinds of reports found throughout District Manager® instantly provide numbers that otherwise are harder to find. Informed business decisions can be made with data that is easy to read. Used by over 14,000 sites globally, SiteLink Web Edition is the software of choice for most Self Storage operators. No software can be expected to provide high level critical data analysis as data interrogation and reporting is a specialist area and deserves special analysis software. District Manager® is an important partner to Sitelink providing users a second level of data analysis from the comprehensive range of reporting already available. District Manager® LITE offers customised reporting and data analysis to raise income. Are you impressed by the features? Check out District Manager® PRO!